I got some gourmet dog cookies for Gemma. They are delicious. They taste like ginger snaps, and go perfectly with a cup of chai. Should I worry that I’m eating my dog’s cookies? And don’t want to share? Posted on February 24, 2008 at 10:47 am in Gemma	| RSS feed You can skip to the end and leave a reply. Perhaps it’s time to go to the grocery store (for humans). They are GOURMET cookies, with all-human type ingredients (like flour, eggs and molasses) (and no preservatives!). 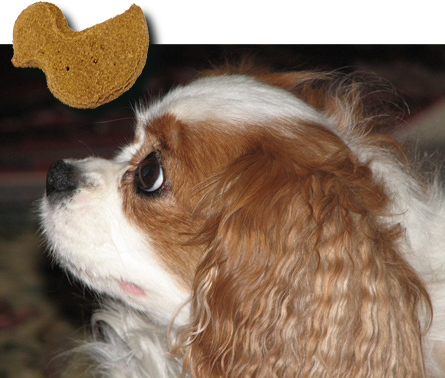 Gourmet or not, these are dog biscuits for a reason, e.g. the ingredients aren’t cut and washed, some health and hygiene regulations [for humans] are overlooked etc etc.